Donald Trump said on the campaign trail that he would do things differently in foreign policy and do different things. Seven days into his presidency, he has been good to his word. Indeed, he has done so many different things differently that you may have had a hard time keeping up. So here is a brief synopsis of some of his initial foreign policy initiatives to help you get up to speed. Announced on Sunday that he planned to hold separate meetings with the leaders of Canada and Mexico to begin discussions on renegotiating the North American Free Trade Agreement (NAFTA). His meeting with Mexican President Enrique Peña Nieto, which was supposed to be next Tuesday, has already been canceled. Despite a phone call today between the two leaders, no new date for a visit has been set. This CFR Backgrounder explains the importance of NAFTA. The New York Times weighs in on what the renegotiations might entail. Michaela Ross worries that a revised NAFTA could drive foreign tech talent to head to Canada and Mexico rather than the United States. 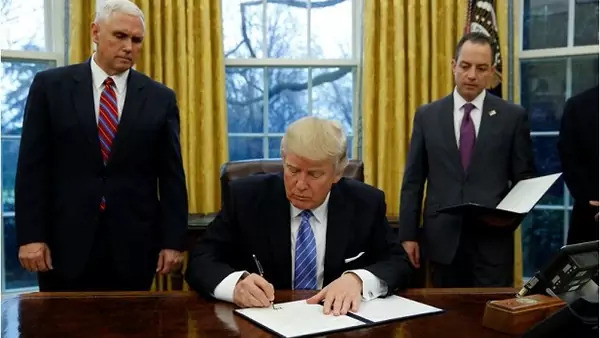 Withdrew the United States from the Trans-Pacific Partnership (TPP) on Monday. In signing the executive order formalizing the withdrawal, Trump said, “We’re going to have trade but we’re going to have it one-on-one, and if somebody misbehaves, we’re going to send them a letter of termination, thirty days, and they’ll either straighten it out or we’re gone. Not one of these deals where we can’t get out of them. It’s a disaster." This CFR Backgrounder explains what TPP would have done, as does this New York Times article. CFR’s Ted Alden argues that Trump gave “away something for nothing.” Samuel Rines believes China will fill the vacuum Trump’s decision has created in the global trading system. Reinstated the so-called Mexico City Policy on Monday. Also known as “the global gag order,” it bars taxpayer dollars from going to overseas organizations that provide abortion services and counseling. The Kaiser Family Foundation provides a nice history of the order. Margaret Talbott argues that Trump’s version of the Mexico City Policy is more expansive than previous versions. The Washington Post predicts that it will most likely affect women in sub-Saharan Africa and South Asia. The Dutch government wants to set up an international fund that would compensate for the end of U.S. support. Ordered the start of construction on a wall along the U.S.-Mexican border in an executive order issued on Wednesday. In a signing ceremony at the Department of Homeland Security, Trump said, “A nation without borders is not a nation. Beginning today, the United States of American gets back control of its borders.” The Washington Post outlines the challenges to building the wall. Directed an expansion and intensification of enforcement of federal immigration laws on Wednesday. Here’s a CFR Backgrounder on the immigration debate and a timeline of U.S. immigration policy. The Pew Research Center reports that the number of unauthorized immigrants in the United States has been steady since 2009. The American Immigration Council estimates the cost of immigration enforcement and border control. Further action on immigration is likely. Told ABC News’ David Muir on Wednesday that he “absolutely” believes that torture works. Trump repeated similar sentiments on Thursday in an interview with Sean Hannity. BBC provides basic facts on waterboarding. Trump said today he would defer to Secretary of Defense James Mattis to decide whether to authorize such techniques. A 2012 Senate Select Intelligence Committee report concluded that the “enhanced interrogation techniques” used during the George W. Bush administration were ineffective. Met today with British Prime Minister Theresa May in his first meeting with a foreign leader. The two discussed Brexit, Russia, and NATO, among other topics. Signed executive orders late this afternoon creating new procedures for vetting immigrants and for buying new weapons systems. In addition to all of this, administration officials circulated draft executive orders that would scale back U.S. support for the United Nations and limit U.S. participation in multilateral treaties. CFR’s Stewart Patrick argues this is a bad idea. The Guardian reports that if these draft policies go into effect they might generate an existential crisis for the UN. At a minimum, the UN can expect a different approach from its largest contributor. Nikki R. Haley, the new U.S. ambassador to the UN, said today in her first public remarks on the job, "You’re going to see a change in the way we do business." That’s a lot of difference. And we are only one week into the Trump administration. Aliya Medetbekova assisted in the preparation of this post.